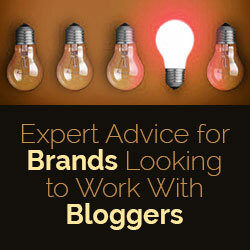 Brands (especially brands with tight budgets) need to choose wisely which bloggers they work with. It shouldn’t just be about the blogger with the largest social media followers and most comments on their blogs or what they boast their traffic is because it is way too easy to fake engagement and traffic. Therefore, vetting bloggers is extremely important. Brands need to make sure they work with bloggers that have true engagement and traffic versus those bloggers who make it look like they do. I have found there a few marketers who understand how to vet the bloggers with fake stats from the real bloggers and Annie Singer is one of them. 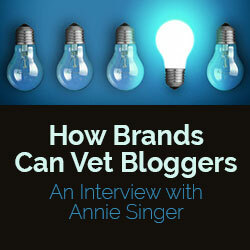 If you haven’t heard of Annie Singer, she is a digital marketer with over a decade of experience in blogging. She has done work in an agency setting, freelance, corporate in-house, as well as managing her own blogs — all of which has helped her understand the complexities of relationship building between companies and bloggers. Currently, she works as an e-commerce growth marketer mainly focusing on SEO, analytics, and CRO to increase brand awareness, sentiment, and revenue and minimize advertising expenses. Her blog posts on blogging, social media engagement and google analytics are so good the people at Google Analytics and Moz take note and re-share them with their audience. Question: What pains you about how brands vet bloggers? Where do you see them go wrong? 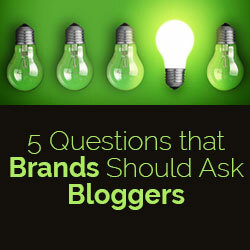 Answer: One of the biggest mistakes I see is handing over blogger outreach to the PR person or team. Blog exposure definitely is PR, but it’s also SEO and digital marketing. Blog etiquette is different than PR etiquette, so it’s easy to rub a blogger the wrong way unintentionally, and there’s a lot of valuable information you can miss if you don’t know exactly what to ask. Question: When you say, “There’s a lot of valuable information you can miss if you don’t know exactly what to ask,” can you list 5 questions that brands should be asking bloggers? What is your average monthly traffic over the last 6 months, in sessions and pageviews? Where does your blog get most of it’s traffic? Can you provide the top 5 traffic sources with approximate percentages? Note: A post on a blog that gets higher search engine traffic as opposed to social media traffic will likely have better longevity. What off-site SEO tactics have you used to grow your website? Do you use “do-follow” or “no-follow” links for sponsorships and reviews? Do you have record of referral traffic to past partners? Note: basic Google Analytics will not track clicks to external websites, but if the blog has Google Tag Manager or a similar system set up, they may have analytic data on actual traffic sent from their sponsored post/review to past partners. Question: Can you share with us where you have seen total failure of vetting bloggers and what the outcome was? Answer: I was working as a social media intern for a big company, and my coworkers hadn’t yet realized the value that I could bring to the team. They asked me to help create a recap report of a “sponsored” review that had already been negotiated and gone live. They sent this blogger over a hundred dollars worth of product in exchange for a review on the blog. The blogger had promised our company that her blog got tons of traffic, and that we would see huge results in terms of click through and SEO benefits. The link in the post ended up getting about 3 clicks in the first month the post was live. When you’re doing sponsored posts or reviews, the first thing to know is that the links need to be no-followed because paid links are a clear violation of Google Webmaster Guidelines. While it’s unlikely that a single paid link will be detrimental, it’s always best to follow best practices as closely as possible. We ended up providing a hundred dollars worth of product for three clicks back to our website, and a link that could cause more damage than benefit to our site. Question: Do you think you can quantify even a rough estimate how much money brands are losing by not vetting their bloggers with more accuracy? Answer: The amount of money your company “loses” by working with a low-quality blog depends on your goals, expectations, and investment in the project. If your goal is to drive sales by working with bloggers, you can use your analytics program to determine how many conversions were brought in from referrals from the blog you are working with, and compare it to your revenue goals. In this example, you are losing money if the post does not generate at least $550 in sales. If your goal is to gain exposure to new audiences or improve sentiment, it’s a lot harder to quantify. You can use things like sentiment and volume of comments, number of social shares, and traffic reports provided by the blogger to determine the value the post has provided to your company. Question: In the last answer you mentioned low-quality blog. 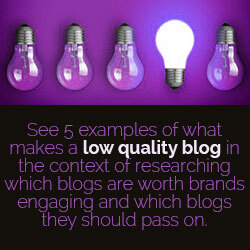 Can you give us 5 examples of what makes a low quality blog in the context of researching which blogs are worth brands engaging and which blogs they should pass on. It doesn’t look good – it’s incredibly easy to create a beautiful website on a budget nowadays – if a website is visually unappealing, you may want to skip it. The blog is hard to navigate – Is it hard to find the blog post you’re looking for? Is it hard to find contact information for the blogger? Can you immediately understand how to share a blog post or leave a comment? It doesn’t have any authority – if you download the free Mozbar, you can instantly see a site’s “Domain Authority” and “Page Authority”. A site with very low authority may be very new, the owner may not make intentional SEO efforts, or they may be making big SEO mistakes. Typically I do not work with sites with a DA lower than 25. It has a high spam ranking – Mozbar also offers a spam score, which gives you immediate insight as to whether the site may be using damaging tactics. The blog has low engagement, or low quality engagement – many blogs use social media plugins that show the number of shares on any particular post. If none of the blog posts are being shared, especially on a website that supposedly has high traffic, you probably want to skip it. Likewise if there are no comments or if the comments are spammy, it’s time to move on. Each of these elements can give you quick insight into the quality of a site, but just because the site is lacking in one area doesn’t mean that you should immediately disqualify it. For example, I might work with a new site with a DA of 12 if it looks great, is easy and pleasant to navigate, and has great social media engagement. Question: Besides forcing bloggers to send screenshots of their Google Analytics that could be manipulated by bought traffic or photoshop, what other tools could a brand use to vet bloggers better and cross reference data to see which bloggers should be chosen for outreach campaigns such as sponsored posts? Answer: Some bloggers lie about their traffic, some simply do not know what the numbers they see mean, and others are completely honest and transparent. Ask for direct access to their traffic reports. You can ask for temporary read-only access to this blog’s Google Analytics so that you can determine for yourself how genuine the quality of traffic is. Most bloggers will not allow this. Use a tool like SEMRush to estimate the volume of traffic. If a blogger tells you they get 10,000 page views per day but SEMRush reports that their organic traffic is only 100 per month, you may want to dig deeper to understand where their traffic comes from, and if they are being honest with you. Use a tool to estimate the SEO health of their website. Moz gives a “spam score”, which (taken with a grain of salt) can be helpful to quickly understand if you need to take a harder look at a blog. You can also look at the backlink profile of a site to help you understand if the blogger has used spammy linking tactics in the past. Look at their social media accounts. Not the number of followers – that is often manipulated as well. Look at the volume of engagement – shares, likes, and discussion on the platform. Avinash Kaushik has a great method of understanding the economic value on different platforms. Blog A has 5,000 Facebook fans and their average post has 50 likes and 5 comments. Blog B has 500,000 Facebook fans and their average post has 100 likes and 20 comments. Should your company work with Blog A or Blog B? Blog B might technically get your brand in front of more eyeballs, but only you can determine whether an audience that unengaged will provide value to you. Does the blog look good? Is it a pleasant experience to find and read a blog post? Are the posts informational and interesting? Are there comments on any of the blog posts? Do the comments seem genuine? If the answer to any of those questions is “no”, move on and find another blogger. If the answer to each question is “yes,” then combine quantitative data like social media following and volume of traffic on similar past posts to determine what kind of exposure you might receive, and how much value that positive exposure is worth to your company. Question: Do you have any final thoughts? Answer: It may seem like I’m attacking bloggers or making very broad assumptions, but blog outreach is a two-way street and companies manipulate and lie as much (if not more) than bloggers. If you want to leverage the audiences of a blogger, expect to provide value back. Bloggers are bombarded with impersonal PR and link building emails every single day asking them – small-timers who might make a few hundred or thousand dollars per month – to essentially work for free for companies that make hundreds of millions of dollars every year. If you have a limited budget for blogger outreach, find alternative forms of value that you can provide to them – offer them free products, or offer to promote their blog post to your own audience. Never expect them to provide quality exposure for your company for nothing in return. Build genuine, mutually beneficial relationships with honest bloggers and you will have an excellent channel of promotion for your company. If you found Annie’s insights valuable, you can read more about her and her thoughts on marketing, SEO, and young adult life at anniesinger.me . You can also read her articles on the Huffington Post, or connect with her on Twitter at @singerswings. PR-PublicRelations.com was founded by Joanna Laznicka, a public relations and online marketing mastermind. After 10 years of successfully managing and marketing hundreds of companies and blogs, the meta-thinker created this forum to help bloggers and public relations experts create personal brands that build business empires and win audience views. 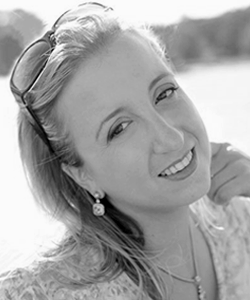 Joanna helps bloggers and business owners overcome the wild, wild web’s madness through education as a speaker, author and one on one mentoring. Great post! I just wanted to mention a few things. These tips are fantastic for more established bloggers, sometimes there can also be benefits to working with newer bloggers. Some of the brands I worked with in my first few months are among my top ranking posts in terms of Google referrals. When considering newer bloggers (with sites less than a year old), I would suggest asking about their rate of growth and also how they promote each post. And it always helps to have read or at least browsed a few of their recent posts and any on topics related to your product. Every day, I receive pitches (usually wanting free link building) for products that just are not a good fit. On the other hand, I am new enough that I am always interested in talking more when it is clear that a rep is familiar with at least one my previous posts. I love the last sentence of this post! Those are excellent words to live and do business by! Great article. Like Sam mentioned above, I think that there are other things to keep in mind when working with bloggers. I always try to create evergreen content that will keep my sponsored post moving forever. Yes, there is no great way to measure this for a current campaign, but it should be noted that the company may stand to get traffic to that post for years to come. I just got back from a blog conference and some of the gals were talking about working with brands. Sometimes, depending on the size of the brand, your work gets paid for and that is where the relationship ends. If a brand really wants to get the most out of their dollars, they can play a part in the reach of that content as well. I’m not suggesting they do the work for the blogger, but they’ve paid for that content. Shouldn’t that content be pushed out in as many places as possible from both the bloggers and brand pages? I know that larger companies have tied hands in terms of that type of thing but when a blogger feels supported, that helps to create loyalty. I love to work with brands that want to build loyalty with me, and sometimes that is just through an extra thank you email. I’m not looking to work with every brand, I’m looking to work with the brands that fit my audience and brand and value the relationship. Thanks for sharing ways to vet bloggers so that I can evaluate how my site comes across and I can learn to provide the right metrics to the brands interested in working with me. I think the biggest thing is to talk with a brand up front and find out exactly what they hope to get out of a campaign so that we can go at it from the same page instead of working for two different goals.